The NRAO’s Very Large Array (VLA) in New Mexico is 40 years old. Today, a replica of Jansky’s scope sits on the lawn in front of Green Bank Observatory, one of the four world-class public radio telescopes in the US. Along with the Very Large Array, Arecibo Observatory, and the Very Long Baseline Array (VLBA), it is the legacy of a boom time in federal investment in the field that began in earnest after World War II. [S]upport for pure science in the US is always complicated, since it relies on the good graces of federal agencies and annual budgets. As funders balance building and operating new scopes with the old, while giving grants to the astronomers who actually use those instruments, something’s gotta give. And no matter what it is, the science will not be the same. Read the full article at WIRED magazine. 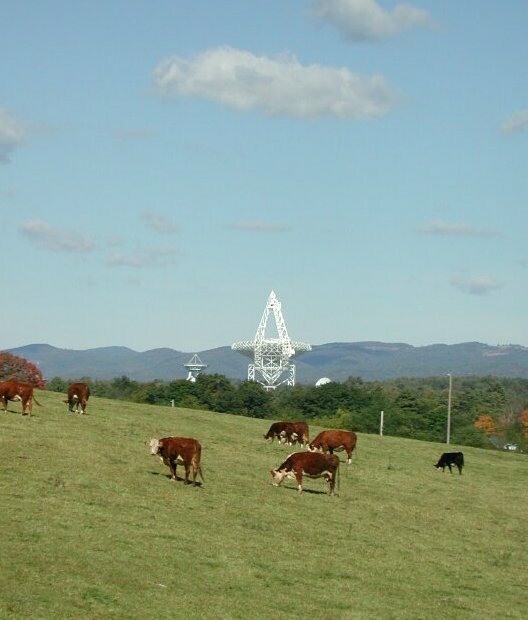 This entry was posted in News and tagged Green Bank Telescope, National Radio Astronomy Obeservatory, ngVLA, NROA, Radio Astronomy, VLA on August 30, 2018 by Thomas. Astronomers are to use one of the world’s largest telescopes to check a mysterious object that is speeding through the solar system for signs of alien technology. 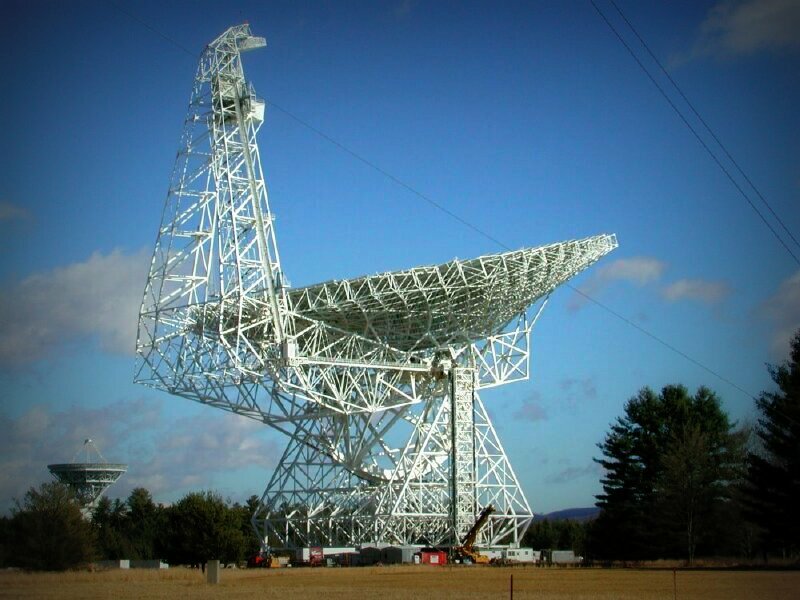 The Green Bank telescope in West Virginia will listen for radio signals being broadcast from a cigar-shaped body which was first spotted in the solar system in October. The body arrived from interstellar space and reached a peak speed of 196,000 mph as it swept past the sun. Scientists on the Breakthrough Listen project, which searches for evidence of alien civilisations, said the Green Bank telescope would monitor the object, named ‘Oumuamua, from Wednesday. The first phase of observations is expected to last 10 hours and will tune in to four different radio transmission bands. The program includes a survey of the 1,000,000 closest stars to Earth. It scans the center of our galaxy and the entire galactic plane. Beyond the Milky Way, it listens for messages from the 100 closest galaxies to ours. The instruments used are among the world’s most powerful. They are 50 times more sensitive than existing telescopes dedicated to the search for intelligence. The radio surveys cover 10 times more of the sky than previous programs. They also cover at least 5 times more of the radio spectrum – and do it 100 times faster. They are sensitive enough to hear a common aircraft radar transmitting to us from any of the 1000 nearest stars. I know it’s out of our common shortwave range and scope of interest, but as a radio listening enthusiast I’m fascinated by this visionary scientific enterprise. Thank you, Ferruccio, for sharing this. Being a fan of radio astronomy, SETI, and weak signal DXing, of course I find this fascinating! Thanks for sharing! This entry was posted in News and tagged Ferruccio Manfieri, Green Bank Telescope, National Radio Astronomy Obeservatory, Radio Astronomy, SETI on December 13, 2017 by Thomas. Green Bank Telescope observations of a dwarf galaxy three billion light years away reveal 15 bursts of radio emission. This is the first time bursts from this source have been seen at these frequencies. San Francisco – August 29, 2017 – Breakthrough Listen – the initiative to find signs of intelligent life in the universe – has detected 15 fast radio bursts emanating from the mysterious “repeater” FRB 121102. Fast radio bursts, or FRBs, are brief, bright pulses of radio emission from distant galaxies. First detected with the Parkes Telescope in Australia, FRBs have now been seen by several radio telescopes around the world. FRB 121102 was discovered in 2012, on November 2nd (hence its name). In 2015, it was the first FRB seen to repeat, ruling out theories of the bursts’ origins that involved the catastrophic destruction of the progenitor (at least in this particular instance). And in 2016, the repeater was the first FRB to have its location pinpointed with sufficient precision to allow its host galaxy to be identified. It resides in a dwarf galaxy about 3 billion light years away from Earth. Attempts to understand the mechanism that generates FRBs have made this galaxy a target of ongoing monitoring campaigns by instruments across the globe. Possible explanations for FRBs range from outbursts from rotating neutron stars with extremely strong magnetic fields, to more speculative ideas that they are directed energy sources used by extraterrestrial civilizations to power spacecraft. Analysis by Dr. Gajjar and the Listen team revealed 15 new pulses from FRB 121102. As well as confirming that the source is in a newly active state, the high resolution of the data obtained by the Listen instrument will allow measurement of the properties of these mysterious bursts at a higher precision than ever possible before. The observations also show for the first time that FRBs emit at higher frequencies (with the brightest emission occurring at around 7 GHz) than previously observed. The extraordinary capabilities of the Listen backend, which is able to record several gigahertz of bandwidth at a time, split into billions of individual channels, enable a new view of the frequency spectrum of FRBs, and should shed additional light on the processes giving rise to FRB emission. The new results are reported as an Astronomer’s Telegram at www.astronomerstelegram.org/?read=10675 and will be described in further detail in an upcoming scientific journal article. Click here to read the full article at Breakthrough Initiatives. This entry was posted in News, Software Defined Radio and tagged Breakthrough Initiatives, Fast Radio Bursts, Green Bank Telescope, National Radio Astronomy Obeservatory, Radio Astronomy, SDR, Software Defined Radio on September 3, 2017 by Thomas. Will Green Bank soon become a little less radio quiet? Disturbing the peace: Can America’s quietest town be saved? There’s a town in West Virginia where there are tight restrictions on mobile signal, wifi and other parts of what most of us know as simply: modern life. It means Green Bank is a place unlike anywhere else in the world. But that could be set to change. “Do you ever sit awake at night and wonder, what if?” I asked. Mike Holstine’s eyes twinkled like the stars he had spent his life’s work observing. “The universe is so huge,” he began. Holstine is business manager at the Green Bank Observatory, the centrepiece of which is the colossal Green Bank Telescope. On a foggy Tuesday morning, I’m standing in the middle of it, looking up, feeling small. Though the GBT has many research tasks, the one everyone talks about is the search for extra-terrestrial intelligence. The GBT listens out for signs of communication or activity by species that are not from Earth. […]Green Bank sits at the heart of the National Radio Quiet Zone, a 13,000 square mile (33,669 sq km) area where certain types of transmissions are restricted so as not to create interference to the variety of instruments set up in the hills – as well as the Green Bank Observatory, there is also Sugar Grove, a US intelligence agency outpost. Read the full article on the BBC News website. Additionally, if you have access to the BBC iPlayer, click here to watch the Click episode featuring Green Bank. This entry was posted in News and tagged BBC, Green Bank Telescope, Green Bank WV, National Radio Astronomy Obeservatory, National Radio Quiet Zone, NRAO, Radio Astronomy, Richard Langley on November 30, 2016 by Thomas. Many thanks to SWLing Post reader, David Freeborough, who shares this brilliant, in-depth radio documentary featured on the BBC News and BBC Radio 4. “Anyone driving west from Washington DC towards the Allegheny Mountains will arrive before long in a vast area without mobile phone signals. This is the National Radio Quiet Zone – 13,000 square miles (34,000 sq km) of radio silence. What is it for and how long will it survive? As we drive into the Allegheny Mountains the car radio fades to static. I glance at my mobile phone but the signal has disappeared. Ahead of us a dazzling white saucer looms above the wooded terrain of West Virginia, getting bigger and bigger with every mile. It’s the planet’s largest land-based movable object – the Robert C Byrd Green Bank Telescope (GBT) – 2.3 acres in surface area, and taller than the Statue of Liberty. The story continues on the BBC News site, but I would encourage you to listen to the five part radio documentary series on BBC Radio 4 first. Green Bank, WV, is certainly one part of the planet where a shortwave radio listener would be quite happy: residents have virtually no radio interference or obnoxious electrical noises that plague the rest of the modern world. My wife and I have camped near the NROA site in Green Bank–it’s a beautiful part of the world. I’m certainly long overdue to return! Again, David, many thanks for sharing this! This entry was posted in Articles, News and tagged BBC, Green Bank Telescope, Green Bank WV, National Radio Astronomy Obeservatory, National Radio Quiet Zone, NRAO, NSF, Radio 4, Radio Astronomy, Radio Documentaries on May 21, 2015 by Thomas.